Let's climb one of the 10 most active volcanoes in the World! 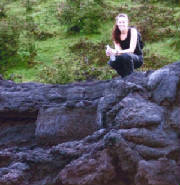 This half-day trip to the top of this highly-active Strombolian volcano will marvel us, as we stand next to the lava. Our guide will explain not only about the volcano and all the eruptions that it had been through recorded history, but we will get a good understanding on how Guatemala, as part of the Central American Corridor was formed millions of years ago. We can take you at any time of the day or night, but we have seen that the best time is to start the climb around 4:00 am. It will take us about 1 1/2 hours to reach the base of the cone, where all the lava can be appreciated. Most of the hike will be through a Mountain Forest, and the very last couple hundred meters will be on an open space. We will be able to enjoy the natural habitat of the forest once we go down, because on the way up the only light we will have will be the one from our headlamps. This is a trip for anyone who is in normal physical conditions. We will climb up to an elevation of 2500 meters Above Sea Level, or some 8250 feet. We feel particularly comfortable being at Pacaya Volcano, not only because we've done this trip hundreds of times, but also because National Geographic Television chose our company to be their logistical counterpart & outfitter during a five-day long documentary about active volcanoes. 3:00 am. Pick up at your hotel in La Antigua or Guatemala City and transfer to the volcano. 4:00 am. We start walking up the volcano. At this point we'll give you some energizing fruit and bottled water. 5:30 am. After a few technical stops on the way, we reach the base of the cone and the lava. 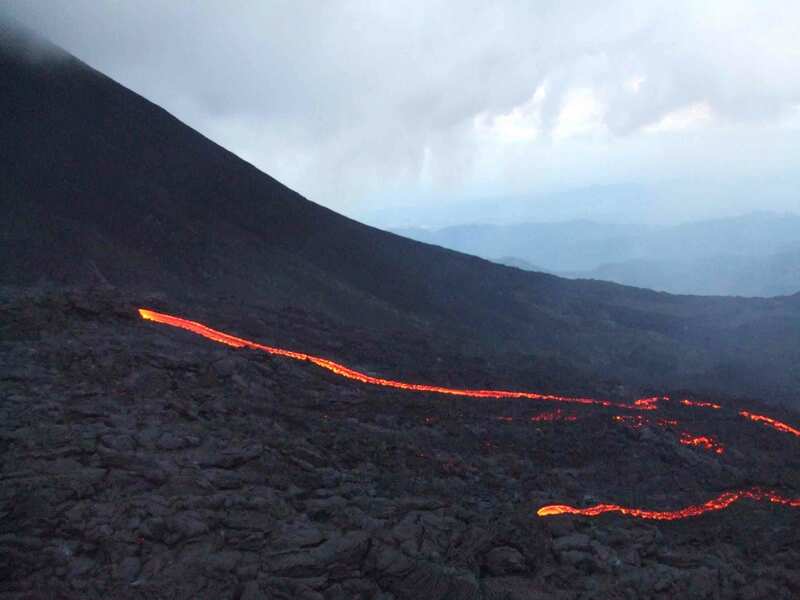 Here we will have magnificent views of the Pacific Ocean Slope, as well as the Guatemala City Valley and the massive "Agua", "Fuego" and "Acatenango" volcanoes. 7:30 am. Breakfast will be served at the base of the cone. 8:30 am. Slowly and sadly we start our descend to where we left the vehicle. 9:30 am. We drive back to your hotel arriving one hour later. At the end of the visit to the volcano, we can drive just a couple kilometers and visit a beautiful lagoon, of volcanic origin as well, take a refreshing bath and finish the morning here. This private reserve has also a "Canopy Speedway", which basically consist of a series of platforms based on very strong trees, all of them linked by thick cables. All this system is suspended close to the canopy of the trees, at some 15 meters or 50 feet high. We will cross from one platform to the next hanging and sliding from the cables. Our security system will be composed of a state-of-the-art harness, attached to the cable. This has an extra cost of US$ 35.00 per person, and includes admission fee to the reserve, as well as the Canopy Speedway and a delicious BBQ.